The U.S. economy is starting to deteriorate, which is what typically happens in the last year of a bull market. *Read today’s fundamental outlook. Fundamentals determine the stock market’s long term direction. Technicals determine the stock market’s medium term direction. As we approach the end of this bull market, fundamentals are more important than technicals. There is not a single technical indicator that can consistently predict bull market tops (without too many false signals). That’s why fundamentals are useful. As we mentioned in our fundamental outlook today, Housing Months of Supply has been trending upwards recently. 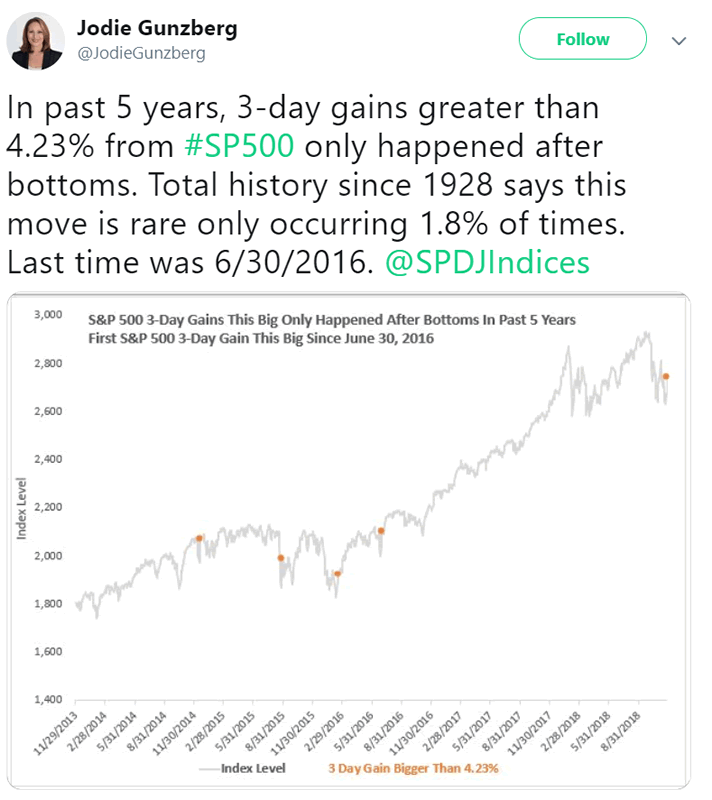 Is this immediately long term bearish for the stock market? Here’s what happened next to the S&P after Housing Months of Supply exceeds 7. As you can see, the stock market tends to do well over the next 6 months, after which forward returns deteriorate. In the final year of a bull market, the stock market goes up in a very volatile manner while the economy deteriorates. As we mentioned in our fundamental outlook today, Initial Claims has trended upwards a little recently. While this will be a long term bearish factor in 2019, I don’t think it’s a cause for concern right now. In our free Golden/Death Cross Model with Initial Claims Filter, we want to see Initial Claims rise above its 1 year moving average for 8 consecutive weeks (i.e. a sustained rise in Initial Claims). So far, Initial Claims has been above its 1 year moving average for 2 consecutive weeks. 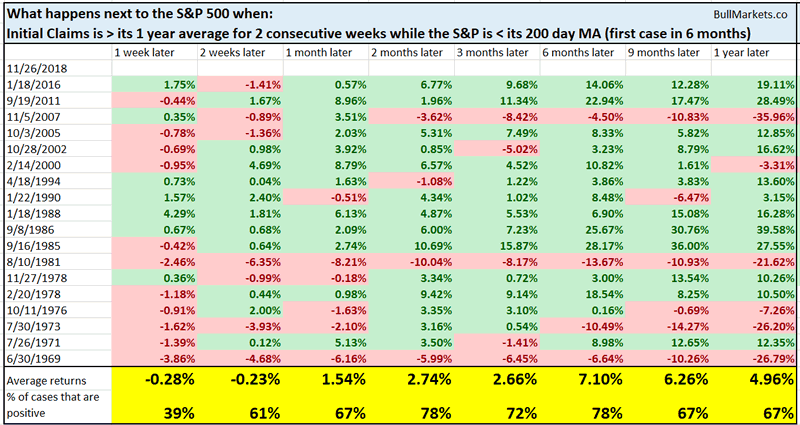 Here’s what happened next to the S&P when Initial Claims is above its 1 year average for 2 consecutive weeks while the S&P is below its 200 day moving average. While this is slightly short term bearish for the stock market, it isn’t medium term or long term bearish for stocks. Wait for Initial Claims to rise a little more before turning long term bearish. The Put/Call ratio’s 20 day moving average was very high at the end of October, which coincided with the stock market’s bottom. With the stock market bouncing off its lows, the Put/Call ratio has returned to normal. As you can see, this isn’t consistently bullish or bearish for the stock market on any time frame. 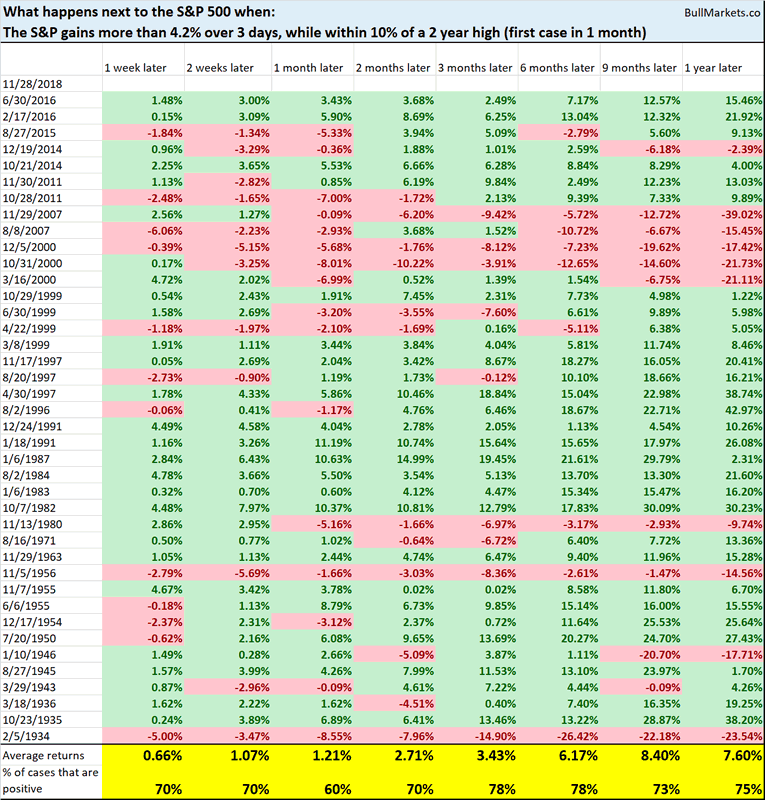 Here’s what happened next to the S&P 500 when it gained more than 4.2% over the past 3 days, while within 10% of a 2 year high. As you can see, this isn’t extremely bullish for stocks. Jodie’s mistake is that she uses limited data: “past 5 years”. Investors and traders should always look at the data holistically instead of selectively. The current bull market will peak sometime in Q2 2019. Then a bear market will ensue.